Australian TV Channels - Terrestrial Free to Air Television - Pinktronix Terrestrial & Satellite Television Installation Services. PinkTronix - Australian TV Channels. Wide Bay, Cooloola and the Sunshine Coast F.T.A. Digital Terrestrial Transmitters. Within that 7 Megahertz bandwidth will be modulated and transmitted the complete suite of the digital channels which each network broadcasts. The digital channel numbering will not necessarily follow the radio frequency channel number. The networks have recognized the potential for confusion here, thus we now have channel names like “Gem” and “7Mate” with little or no reference to the real radio frequency channel number. In fact, it would come as no surprise if, over time, the networks would remove numbers from their call sign altogether. 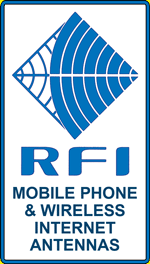 Until digital switchover and, depending on location the radio frequency channel allocation can be anywhere from channel 0 in the Very High Frequency spectrum to channel 75 in the Ultra High Frequency spectrum. The Australian Digital Video Broadcast channel plan begins at VHF channel 6 and finishes at UHF channel 75. Digital Audio Broadcasting has also been allocated to V.H.F. channels 6 thru 12 and will share the spectrum with some T.V. channels. The North West area of Wide Bay is served by a VHF/UHF transmitter at Mt. Goonaneman near Biggenden, a UHF transmitter at Ghost Hill to the west of Hervey Bay, a UHF transmitter at Mt. Mowbullan to the north of Cooyar and a UHF transmitter at Mt. England to the north of Murgon. Further north are UHF transmitters at Reservoir Hill in Eidsvold and on the Mulgildie Plateau just south of Monto. 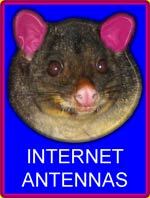 Gympie and district is also served by the VHF/ UHF transmitter at Mt. Goonaneman a UHF transmitter on Tozer hill and a UHF transmitter on Black Mountain. 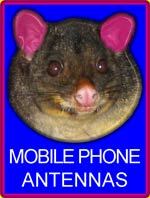 Parts of Lifestyle Mooloo, Tin Can Bay, Rainbow Beach and Fraser Island are also served by the VHF/UHF transmitter at Mt. Goonaneman. Cooloola Village has an analogue “Self Help” UHF transmitter located on Reservoir Hill which may be upgraded to fully digital before analogue switch off date. The Pomona, Kin Kin, Noosa, and Sunshine Coast area are served by UHF transmitters at Black Mountain, just outside of Cooroy, Sunrise Road near Tewantin, Dulong near Mapleton and Bald Knob near Maleny on the Black Mountain Range. 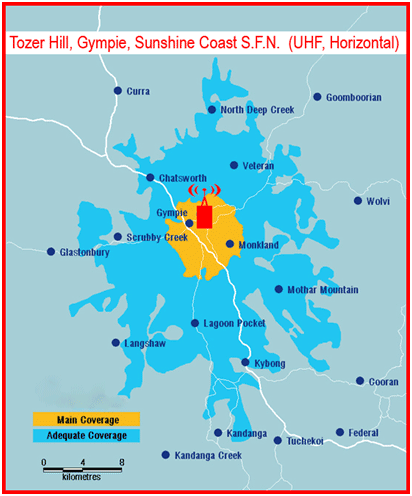 The southern portion of the Sunshine Coast may also be able to receive signals from the transmitters at Mt. Cootha but unless you are in a localised black spot there is probably no advantage save for the convenience of time shifting, a feat now more easily and conveniently done with personal video recorders. On arrival at site the technician will show the customer coverage area maps, perform a quick field strength survey and work with the customer to determine the most cost effective solution for the installation.